Summary: One of the oldest water treatment technologies remains one of the most cost-effective methods of removing volatile organic compounds (VOCs) and other contaminants including MTBE and radon. For years, Norway Water District in western Maine used potassium hydroxide to reduce the naturally high levels of carbon dioxide present in the district’s drinking water, virtually all of which is pumped from local groundwater sources. Lowering carbon dioxide was important to reduce potential corrosion in the copper and lead pipes that are typically used by the district’s customers, said Ryan Lippincott, the district’s superintendent. Seeking an environmentally friendly solution, Lippincott discovered that he could eliminate the use of potassium hydroxide, lower his treatment and maintenance costs and improve employee safety by installing an air stripping system. 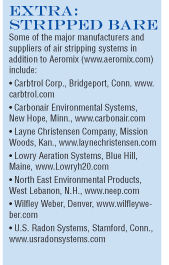 In Norway Water District’s case, four Series 6 BREEZE compact air strippers and an accompanying set of air blowers were manufactured by Minneapolis-based Aeromix. While the district’s electricity costs have climbed as a result of the increased pumping needed to run the air stripping system, costs are far less than the cost of purchasing potassium hydroxide, Lippincott said. As a result, the district has been able to reduce its carbon dioxide treatment costs by at least one-third. The air stripping system also removes radon, he added, which is an important bonus considering the anticipated strengthening of U.S. Environmental Protection Agency (USEPA) guidelines for radon during the next few years. “It improved our overall system,” Lippincott said. “Our water quality has improved and we have less taste and odor problems.” While air stripping is one of the oldest water treatment technologies, it remains one of the most useful methods of cleaning drinking water, particularly from groundwater sources. 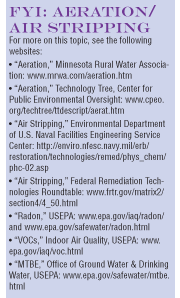 Many water districts across the country are finding that air stripping isn’t only a useful tool to reduce carbon dioxide and radon, but MTBE (methyl tertiary-butyl ether), TCE (trichloroethylene), benzene and other contaminants are becoming increasingly problematic due to increasingly stringent environmental regulations. “Air stripping is a very popular approach to removing contaminants from groundwater,” said Rey Rodriguez, president of H2O R2 Consulting Engineers in Glendora, Calif. “It’s an effective technology.” As a result, air stripping products remain a standard product offering for many companies in the water treatment business (see EXTRA: Stripped Bare). While air stripping has a number of applications, Rodriguez said it has been found to be particularly effective at removing MTBE when found in water in relatively low concentrations of less than 1 mg/L. He cautioned, however, that MTBE is generally more difficult and costly to remove than other compounds, and that carbon filters are often needed to address spikes in MTBE concentrations, which can occur through sustained groundwater pumping. Packed Tower Aeration: In this approach, contaminated water flows downward by gravity through a circular or rectangular column that’s filled with either randomly packed or structured packing material. Air is introduced into the tower below the packed bed and flows upward through the column against the flow of water. The packing material is designed to maximize the surface area for contact between the contaminated water and the process air, thereby maximizing the stripping of VOCs and other contaminants. Packed towers are used at many water treatment facilities across the United States with flow rates from less than 1 million gallons per day (or 694 gpm) to 20 million gallons per day (13,900 gpm). 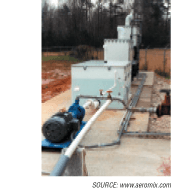 Low Profile Aeration: In this type of system, contaminated water is pumped to the top of the stripper where it flows into a baffled aeration tray. Air is forced up through perforations in the tray bottom, creating highly turbulent conditions to maximize the contact of water and air. Multiple trays may be vertically stacked. The contact time to achieve the desired VOC removal efficiency depends on the size of the tray, liquid flow rate and the number of stacked trays. Bubble Diffusion Aeration: In this system, air is released through fine bubble diffusers at the bottom of a water-filled tank. Rising bubbles create turbulent mixing, which provides the air/water contact area necessary for contaminant stripping. Multiple chambers can be used to increase the degree of contaminant stripping. Design variables include basin depth, number of aeration stages, air flow rate and water flow rates, and the selection of the bubble generators that define bubble size. Spray Towers: In this system, contaminated water is passed through one more nozzle and sprayed into a collection basin or tank. Spray aeration systems are typically used for degassing applications, although they have been used to remove VOCs from water. Aspiration: Aspiration or centrifugal stripping involves injection of the contaminated water into a co-current, tangential flow aspirator. Untreated and/or recirculated water is pumped into a collar and then through multiple orifices into the throat of the aspirator. As the water passes through the aspirator, the orifices act like turbulent jets, which create a large water surface area and enhance the rate of transfer of VOCs to the air. The configuration of the collar and the type and number of orifices in the aspirator are designed to create a low air/water ratio. Analyze your contaminants and assess their physical properties. Perform a complete cost analysis comparing the difference between air stripping and carbon adsorption technologies. Be sure to estimate the power consumption levels of various options. Consider the visual or noise impacts of the systems that interest you. Some may not be suitable for treatment facilities located in or near residential areas. Ask for actual test data to review the performance of the systems that interest you. Consider what other kinds of water treatment systems will need to be used in conjunction with air stripping to ensure proper removal of all contaminants in your location. Check case studies and review manufacturers’ references. Pay attention not only to the upfront investment costs, but the long-term costs of maintaining the equipment. As with most things, the final determining factor in which type of air stripping system to employ is money. Yet, efficacy of the technology or method is just as important in determining whether the route you choose is cost effective. In addition, it’s wise to carry out appropriate pilot studies to directly measure the performance of the proposed aeration process. In many cases, manufacturers have mobile test rigs that can be used to gain direct practical experience and performance data.